Janet Kataaha Museveni born June 24, 1948 is the First Lady of Uganda. 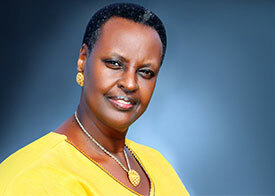 She is married to Yoweri Museveni, with whom they have four children. She is the current Minister of Education in Uganda's Cabinet. Janet Museveni went into exile in 1971, when Idi Amin toppled the Obote I regime in a military coup. She married Yoweri Museveni in August 1973. When Idi Amin's regime fell from power in April 1979, she moved back to Uganda from Tanzania where she had been living in exile with her husband. In February 1981; Janet Museveni and her children re-located to Nairobi, Kenya, where they lived with family friends until 1983. In 1983, they moved to Gothenburg, Sweden, and stayed there until May 1986, four months after Yoweri Museveni's National Resistance Army had seized power in Kampala. Janet Museveni an old girl of Bweranyagye Girls’ Secondary School; holds a Bachelor’s Degree in Education from Makerere University which she acquired in 1997 after joining the university in 1995. She also has a Diploma in Early Childhood Development from Sweden. In November 2005 Janet Museveni showed her desire to join active politics when she announced that she would seek the parliamentary seat of Ruhaama County, in the February 2006 Ugandan general elections. She contested the seat against the candidate for Forum for Democratic Change, Augustine Ruzindana, and won overwhelmingly. She was re-elected in March 2011 to another five-year term. On 16 February 2009, Janet Museveni was appointed State Minister for Karamoja Affairs and later appointed Minister of Education, a post she holds to date. Aside politics and being the first lady of Uganda; Janet Museveni boasts of other achievements such as being the founder of Uganda Women's Effort to Save Orphans (UWESO), an indigenous NGO which cares for war-related and HIV/AIDS-affected orphans in all the Districts of Uganda. The NGO has been in operation since 1986 and works with major UN agencies and other international donor agencies. The first lady is also the founder and Patron of National Strategy for the Advancement of Rural Women in Uganda (NSARWU), an NGO which works with poor rural women to empower them economically through various interventions. Founder and Patron of the Uganda Youth Forum (UYF) and NGO that engages the youth of Uganda for purposes of character and behavior formation particularly with regard to HIV and AIDS prevention. Janet Museveni is also the Patron of the Safe Motherhood Initiative of the Ministry of Health and WHO for reduction of maternal mortality and morbidity. She is as well the Co-chair of CURE Hospital - a special Hospital for crippled children in Uganda, with CURE International. Above all Janet Museveni is a Professed and active Christian whose work and life is driven by faith.